12.5 : 6.25 : : 7 : ? CDE, IHG, KLM, QPO, STU, ? Q5. In a certain code language, ‘+’ represents ‘x’, ‘-‘ represents ‘+’, ‘x’ represents ‘÷’ and ‘÷’ represents ‘-‘. 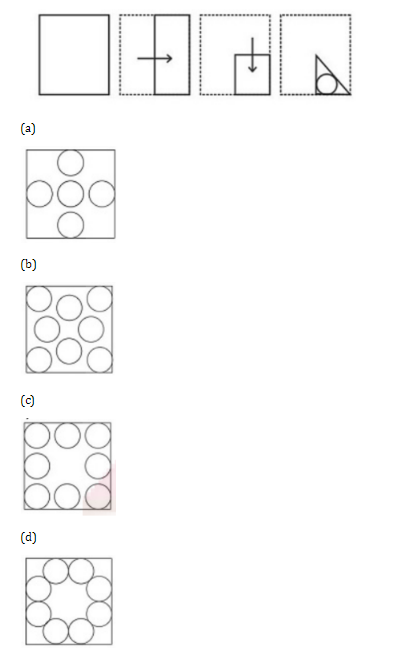 What is the answer to the following question? 50 + 5 – 700 x 28 = ? Statement 1 : All ﬂowers are leaves./कथन 1: सभी फूल पत्ते है. Statement 2 : Some ﬂowers are plants./कथन 2: कुछ फूल पौधे है. Conclusion I : Some leaves are plants./निष्कर्ष I: कुछ पत्ते पौधे है. 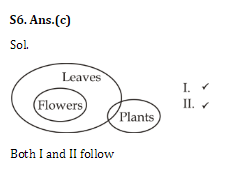 Conclusion II : Some plants are ﬂowers./निष्कर्ष II: कुछ पौधे फूल है. Q8. Anu and Bittu start from the same point. 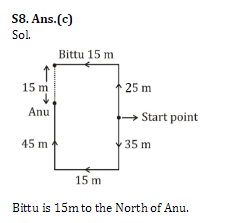 Anu walks 35 m South, then turns West and walks 15 m, then turns to his right and walks 45 m. At the same time, Bittu walks 25 m North, then turns to his left and walks 15m. Where is Bittu now with respect to the position of Anu? अनु और बिट्टू एक ही बिंदु से चलना शुरू करते है. अनु 35 मीटर दक्षिण की ओर चलती है, फिर पश्चिम की ओर मुड़ती है और 15 मीटर चलती है, फिर अपने दाहिने ओर मुडती है और 45 मीटर चलती है. 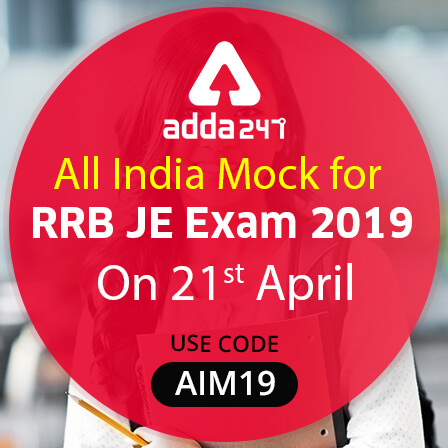 उसी समय, बिट्टू 25 मीटर उत्तर चलता है, फिर अपने बाएं मुड़ता है और 15 मीटर चलता है. अब अनु की स्थिति के संदर्भ में बिट्टू कहाँ है? Q9. In the question a statement is given, followed by two arguments, I and II. You have to consider the statement to be true even if it seems to be at variance from commonly known facts. You have to decide which of the given arguments, if any, is a strong argument. Argument II: Yes, 90% of road accidents involve drivers who are under influence of alcohol./ तर्क II: हां, 90% सड़क दुर्घटनाओं में ड्राइवर शामिल हैं जो शराब के प्रभाव में होते हैं. Q10. A is 40 m South-west of B. C is 40 m South-east of B. 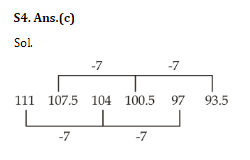 Then, C is in which direction of A? Q11. Pointing towards Rita, Nikhil said.” I am the only son of her mother’s son.” How is Rita related to Nikhil? Sol. Rita’s mother son—Rita’s brother. Hence she is aunt. Q12. In a certain code, SPRING is written as UNUFRC. How is MOBILE Written in that code? Sol. The first, third and fifth letters of the word are each moved two, three and four steps forward respectively while the second, fourth and sixth letters are moved two, three and four steps backward respectively to obtain the corresponding letters of the code. Q15. A word is represented by only one set of numbers as given in any one of the alternatives. 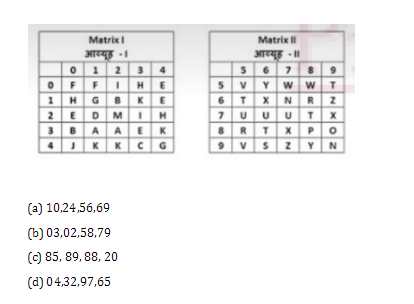 The sets of numbers given in the alternatives are represented by two classes of alphabets as shown in the given two matrices. The columns and rows of Matrix-I are numbered from 0 to 4 and that of Matrix-II are numbered from 5 to 9. A letter from these matrices can be represented first by its row and next by its column, for example ‘K’ can be represented by 41, 42 etc and ‘Z’ can be represented by 69, 96 etc. Similarly, you have to identify the set for the word ‘ROPE’. एक शब्द को केवल एक संख्या सेट से दर्शाया जा सकता है जैसा कि नीचे दिया है. विकल्पों में दिए गए संख्याओं के सेट दो वर्णों के द्वारा प्रस्तुत किए जाते हैं जैसा कि नीचे दिए गए मैट्रिकस में दिखाया गया है. मैट्रिक्स-I को 0 से 4 तक संख्या दी गई हैं और उसी प्रकार मैट्रिक्स II को 5 से 9 तक संख्याएं दी गई हैं. एक वर्ण को पहले उसकी पंक्ति द्वारा फिर उसके स्तम्भ द्वारा दर्शया जा सकता है, उदाहरण ‘K’ को 41, 42 आदि. और ‘Z’ को 69, 96 आदि द्वारा दर्शाया जा सकता है उसी प्रकार आपको शब्द ‘ROPE’ के लिए संख्या सेट ज्ञात करना है.